Bison face a harsh and sometimes brutal existence in Yellowstone National Park. 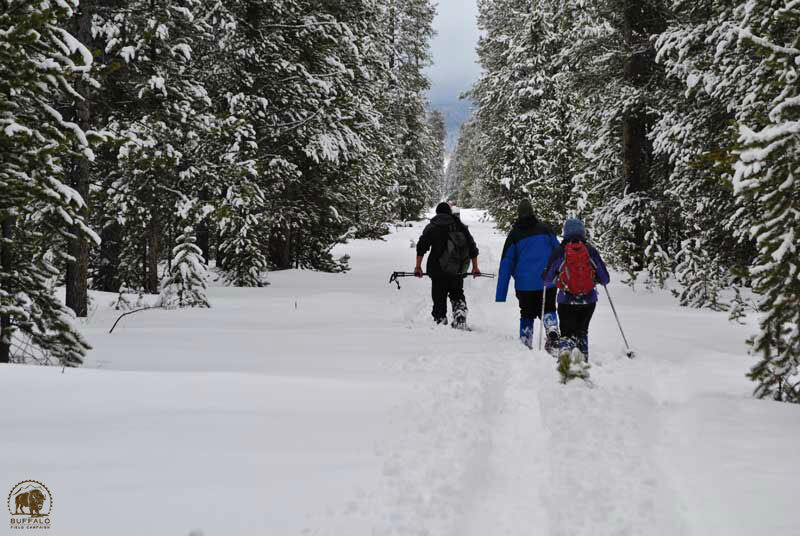 In winter this ecosystem is well known for its deep freezes, long winters, and healthy populations of natural predators. However, it is human impact that offers the only significant threat to the last wild bison. Modern human behavior is endangering the future of wild, free-roaming, genetically intact buffalo. This is why BFC spends so much time and energy defending these rare herds in the field. Our actions to protect wild bison follow a carefully planned, multi-pronged strategy. We permanently protect buffalo through our patrols, grassroots citizen advocacy, litigation, and legislation...but wait! You came to this page to learn about our field work! BFC volunteers conduct daily field patrols. By patrol we mean two or more of our dedicated volunteers traveling the roads, trails, valleys, hills, and habitat of the last wild buffalo. These patrols document the locations of buffalo and other wildlife, and watch for signs of harassment, abuse, or slaughter of animals or their ecosystem—especially buffalo! Depending on weather, patrols might use a combination of vehicles, boots, skis, snowshoes, and/or mountain bikes—but we are almost always patrolling and protecting the buffalo. Our teams monitor key bison migration corridors and core habitat areas along the Yellowstone boundary year-round, including several months of 24-hour coverage through each cold winter when the buffalo need our protection the most. engage in a wide variety of other actions. Whatever the weather or time of day: we are prepared to stand with the buffalo. BFC is a grassroots organization that spends our time and money on action rather than on self-promotion. However, those who mean harm to buffalo--as well as those who care for them--know exactly who we are. 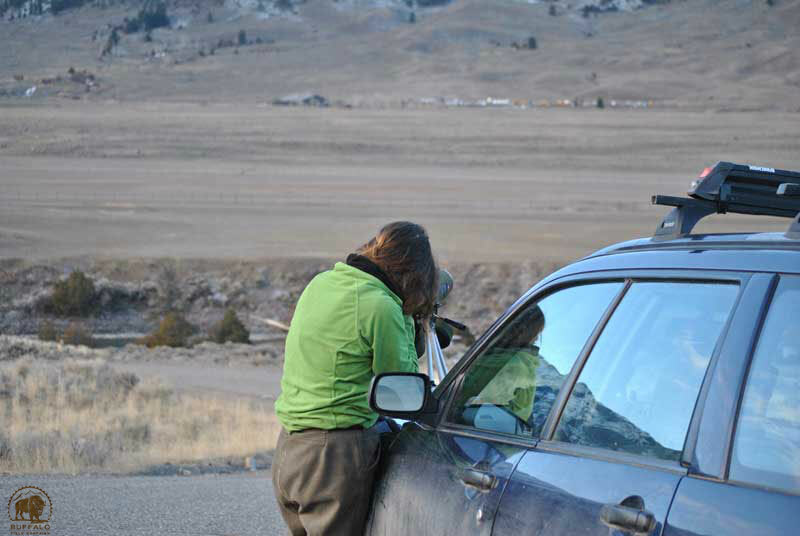 When our patrols encounter harassment of buffalo, in or outside of the park, we document the occurrence with whatever tools we have (eye witnesses, notebooks, still and video cameras, etc.). As each situation unfolds, we slowly and safely move as close to the action as we can—making the perpetrators aware of our presence and our documentation activities as we determine what potential next steps to take. BFC volunteers seek to neutralize situations in a nonviolent yet uncompromising manner, while at all times focusing on creating the best outcomes for the buffalo. When close enough, we use various equipment to capture images of faces, badge numbers, vehicle license plates, presence/use of firearms, and other information for possible use in the future by buffalo defense litigators and others who might find it useful—including national and global media outlets. Using cameras and images as our only “weapons,” we share footage of current buffalo atrocities via every method available to us. We have found that the public’s viewing of and outrage about what is happening is one of the best paths for true and lasting change on behalf of the buffalo. 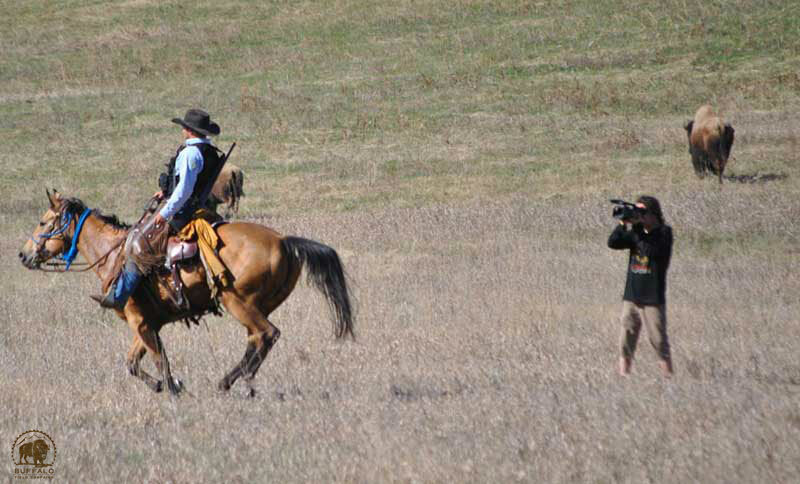 There are, of course, many tense moments in the field during our campaigns to protect the buffalo. If circumstances escalate and become potentially violent, BFC teams simply will not engage or validate such behavior. 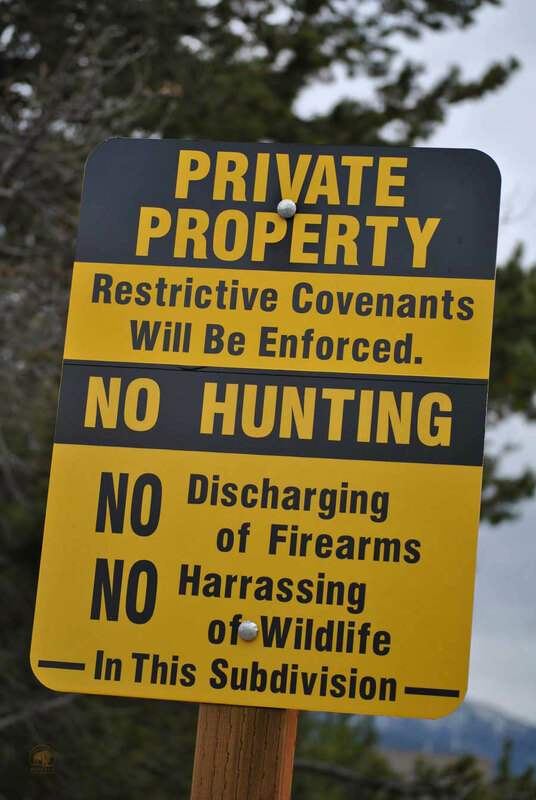 BFC field volunteer videos armed government agents in “hostile hazing territory." We are often asked why we don’t report harassment of the magnificent buffalo to federal, state, or local authorities, and there is one simple answer: Because it is exactly these agencies that are abusing and/or killing the buffalo! And you, dear reader, are paying for it with your tax dollars (if you are a US taxpayer). Interested in volunteering with BFC? Click here to learn more! Our teams also regularly work to alert passing motorists to the presence of buffalo on and near the highways to reduce accidents and increase public awareness of wildlife migration corridors, and we successfully petitioned the state to lower the speed limit through buffalo migration corridors. This has saved many buffalo lives—and human lives as well. 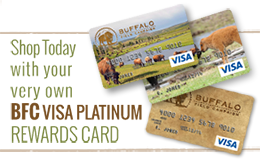 In addition to the buffalo, the security of human visitors within the Yellowstone ecosystem is increased because of BFC’s work! 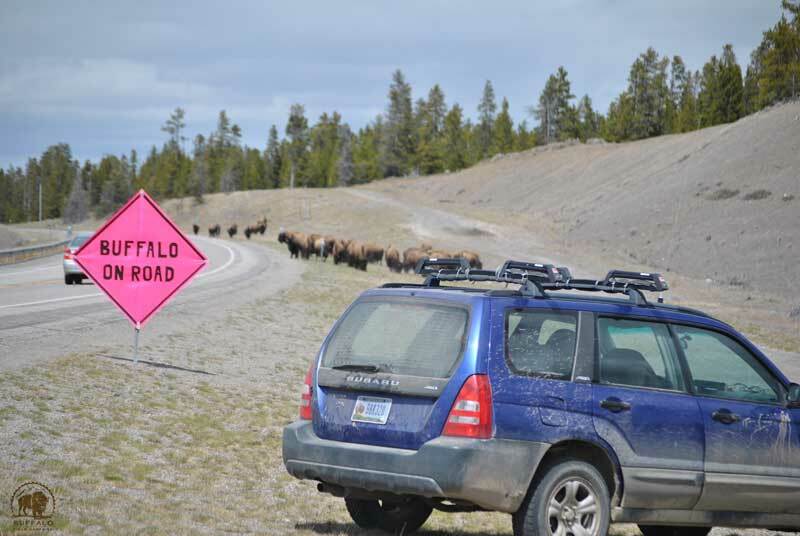 In addition to highway flagging to reduce the number of bison-vehicle collisions, we are working to initate safe passage infrastructure along key sections of highway where buffalo crossings frequently occur. These highway projects, such as wildlife overpasses and underpasses, would significantly reduce danger to both bison and motorists. Similar projects have been implimented with great success in Northwestern Montana, British Columbia, and elsewhere. Whatever we are, and whatever we are doing: we are the silent watchers, the guardians of the buffalo. Armed with only our conviction—and audio/visual recording equipment—we seek out, document, and reduce instances of conflict between buffalo and humanity. Since 1997, more than 5,000 volunteers have been a part of our hands-on, frontline patrols to protect the buffalo, all the while learning about activism, leadership, and direct action. Many BFC volunteers go on to create or support other organizations...but BFC is always close to their hearts. BFC is a small group, but our effectiveness often exceeds the biggest of the national groups! During the winter of 1996-1997—the year before BFC was established—government agents killed almost 1,100 bison. In 1997-1998, with BFC patrols and cameras following the government’s every move, agents killed just 11 of these magnificent animals. More recently, in December of 2012, government agencies announced a plan to kill more than 500 buffalo (400 of them female) during the winter and spring of 2012-2013. BFC’s work in the field, in the courts, and in the halls of politics—greatly supported by our grassroots activist network—was able to hold the number of killings to just 250. While we are thrilled to have saved half the animals intended for slaughter, the truth is that the Montana Department of Fish, Wildlife, and Parks (FWP) and the Montana Department of Livestock (DOL) hindered our efforts. Rather than deal with BFC’s field patrols, the DOL worked with FWP to encourage hunters (rather than government agents) to kill as many buffalo as possible. Additionally, many Native Amerian tribes have been hunting along the Yellowstone boundary under treaty rights, taking hundreds of buffalo. Hunts are more widely disbursed and harder to monitor than government activities. This has allowed the government to use the public (hunters) to do the murderous and dirty work of killing an animal that should be listed as an endangered species. 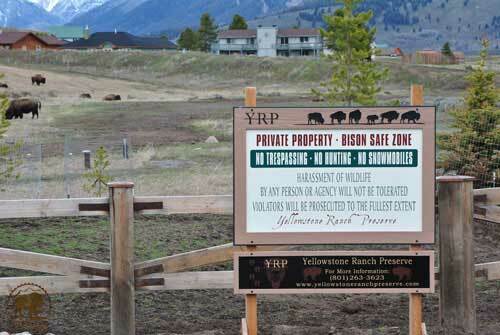 Click here to sign our petition to get “endangered species status” for the Yellowstone buffalo. BFC enjoys incredible support and participation from the local community, and we are always looking for new ways to protect buffalo and engage people in our mission. Some residents allow us to post signs on their property designating them as "Buffalo Safe Zones." We also offer a fence repair service to mitigate damage caused by wildlife. Locals frequently join us on our daily patrols, while others support our patrols financially, with strategic tips, or even with hot drinks and food. A few examples of our community efforts reaping results! 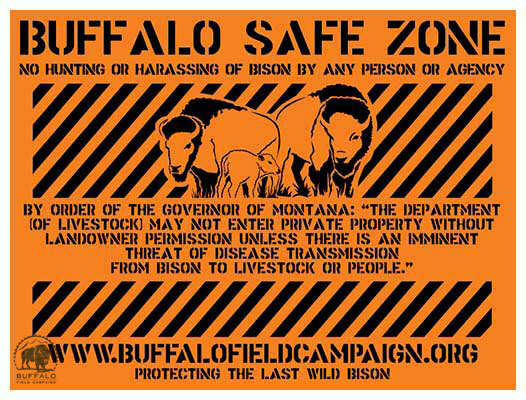 You can purchase your own “Buffalo Safe Zone” sign in our store, here. Our field work, legislative efforts, and legal initiatives often get the majority of attention, but the buffalo are lucky to have a truly wonderful (and super effective) administrative team as well! This small but mighty crew runs outreach programs, creates and shares presentations, coordinates summer tabling activities in Yellowstone Park, edits photos and videos, corresponds with supporters, shares “Updates from the Field” and website updates, facilitates our staggering media coverage through press releases and video...and so very much more. No victory is won without strong supply, logistical, and administrative efforts: and the buffalo are very lucky that we have people involved with skillsets much different from what is needed in the field. The next time you call or email our office, please share a kind word with these generous souls. What about you? How will you join in and help save the last wild buffalo? 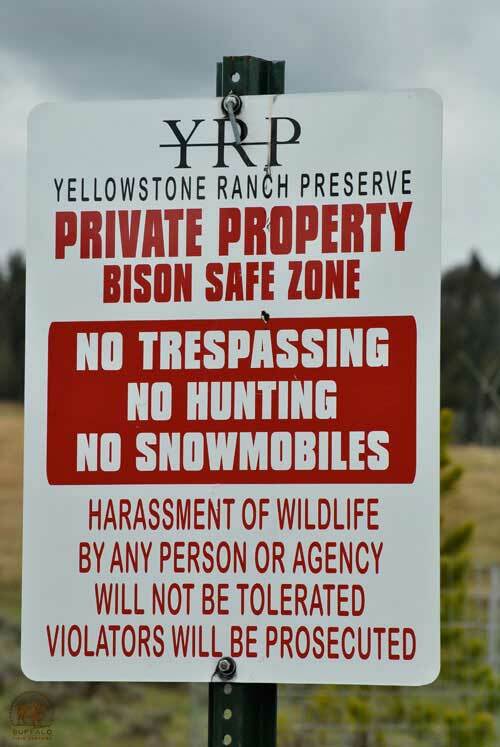 The vast Yellowstone ecosystem is too large for us to patrol completely. Our resources are limited, and the truth is that most years some buffalo are killed—but not for lack of effort on our part. Many more would be slaughtered if not for our constant vigilance. BFC is the only group working in the field—every day buffalo are in danger—to stop the slaughter and harassment of Yellowstone's wild buffalo...but we cannot do this work alone. If you are interested in joining our patrols in the field, please read about what it is like to volunteer at our Base Camp—and how YOU CAN! The future of the buffalo is in our hands. 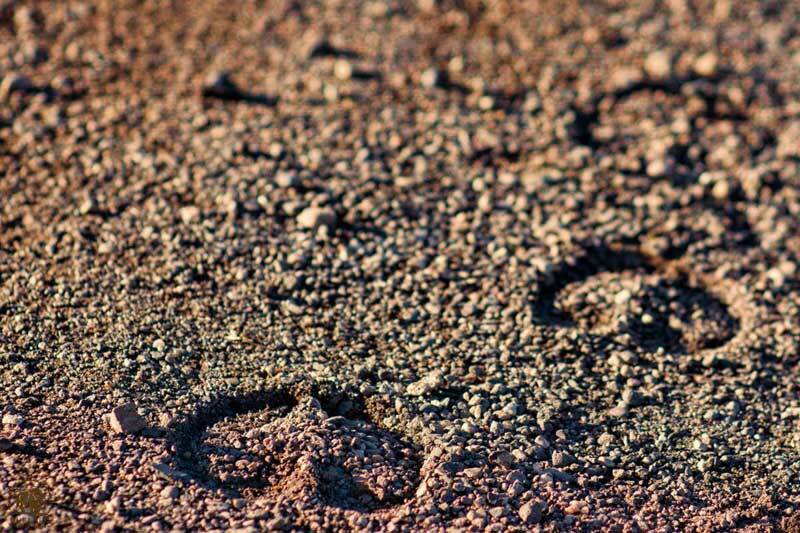 Will our children see buffalo footprints in the sand...?